We’ve all seen it: A friend, family member or colleague has a genius startup idea for a product, service or cause, but the idea falters before ever making an impact. Why? Your connection failed to reach his target audiences in a compelling, memorable manner. To succeed in a competitive marketplace where consumers are growing increasingly annoyed by intrusive advertising, your message needs to reach your target audiences and inspire them to respond in some way. You need your target audiences to do more than see or hear your message – you need them to pay attention, understand, remember and take action. But your message can easily become tied down by message-trapping strings, holding it back from its full potential. Take a look at the video below and discover why your message is not being received or retained by your audience. Here, we explore the five strings, providing bite size tips for cutting the strings and getting your message to your target audience. Your message is trapped in the wrong medium. Too many messages are trapped in a medium that are harder for people to consume in a deep and memorable way. Eighty-three percent of learning occurs visually and 11 percent occurs audibly; combining audio and video increases retention to 65 percent. TruScribe’s whiteboard videos are 50 times more likely to receive a high search engine ranking than traditional text pages. A common belief about video is that all videos must be kept short (no longer than 90 seconds), lest you risk losing viewers with short attention spans. But short videos are often guilty of cramming too much information (product benefits, features, value propositions, et cetera) into a small space. TruScribe’s whiteboard animations use hand-drawn illustrations to tell stories, keeping viewers’ attention longer. Your message is tangled in a format that’s hard to process. If your product, service, or cause is difficult to explain, you want to present it in as much detail as possible, ensuring your competitive advantage is clearly represented. However, stacks of facts and figures and never-ending PowerPoint presentations make it hard (and likely boring) for your audience to process. Sharing information in a story format is a much more engaging alternative. When you choose to take advantage of the benefits of video, but don’t have the skills necessary for production, you’re at the mercy of a video production company that may never deliver on time or within the budget. 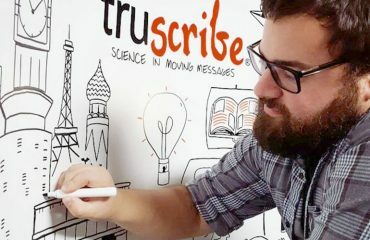 TruScribe is a pioneer in whiteboard animation videos, delivering thousands of videos since our founding in 2011. Your video just isn’t working. You’ve overcome the other message-trapping strings to create an attention-grabbing video and feel like it should be soaring, but you don’t see the invisible threads of how often and how long people are engaged with your message. Sites like YouTube offer free video hosting and analytics functions, while dedicated video hosting sites like Vidyard or Wistia provide even more tools that can be used to understand how your audience is engaging with each of your video clips. Do any (or all) of these message-trapping strings seem too familiar to you?